As the first Friday of December falls, Erika Hay travels to the Cairngorm mountains to find out more about the majestic animals gracing its landscape and the small family unit running it. Not many animals can survive at the top of the Cairngorms in the Scottish Highlands but the 1,219-metre (4,000ft) peaks are ideal for the UK’s only free-ranging herd of reindeer. The Cairngorm Reindeer Centre is very much run as a family business, led by Alan and Tilly Smith and their two children, Alex and Fiona. The diversification enterprise has provided them with a living which otherwise could not be achieved from hill farming alone. About 20,000 people visit the centre at Glenmore, near Aviemore, every year, with most making the trek up the hill to find the 150-strong herd foraging among the rocks and snow. The Smiths also have several teams of trained reindeer which are much in demand at city centre events throughout the country as the run up to Christmas now begins. Tilly says: "Alan and I have worked hard to build up the business and now it is sustainable we can generate a good income for ourselves and our employees." The couple employ seven people full-time and seasonal staff as and when required and unsurprisingly are not short of volunteers to help out in the summer months. 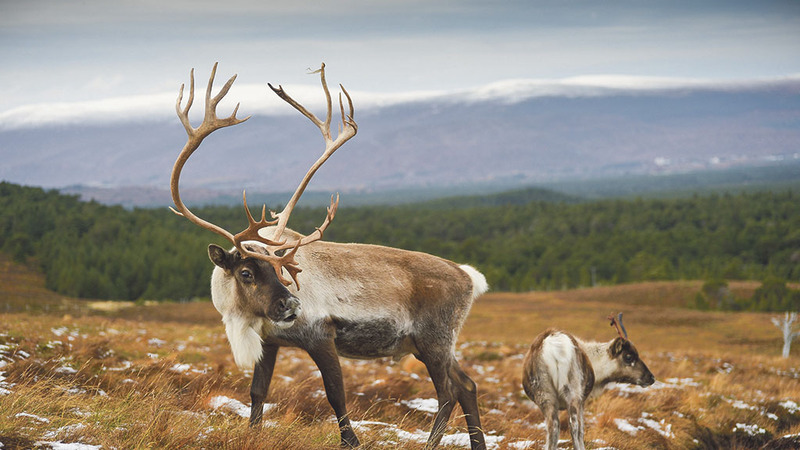 The Reindeer Centre is run in conjunction with their hill farm, about 30 miles away on the Glenlivet Estate, where they have a commercial herd of 200 red deer hinds alongside Belted Galloway cattle, Soay sheep and Iron Age pigs. "The reindeer had been running on the same area for about 40 years so we were delighted when we had the chance to take on some fresh ground at Glenlivet. It has benefited the reindeer hugely, which are split between the two places," says Tilly. The two Glenlivet farms, which are leased from the Crown Estate, total 283 hectares (700 acres) running from 228-457m (750-1,500ft) but the Smith’s also have access to 809ha (2,000 acres) of winter grazing at the top of the hill for the reindeer. Alan and Tilly are based there now, with Alex working between there and the Reindeer Centre and Fiona, managing the Reindeer Centre at Glenmore. A conscious decision was made to introduce low input, native livestock to the farms, which attract visits from many specialist farming groups, including some from France, Germany and the USA. The 20 Belted Galloway cows are kept pure with breeding heifers sold at Carlisle and steers finished, butchered and sold from the farm to regular customers. Tilly says there is quite a demand for breeding females from the 50-strong Soay sheep flock, but anything not sold for breeding is also finished and sold from freezers on the farm under the Wild Farm brand. Progeny of the five Iron Age sows are treated the same way. The red deer is a relatively new enterprise but was an obvious choice as the farm had the suitable hill ground required to breed them commercially and the Smiths erected deer fencing themselves. The stag calves are sent to Bob Prentice, Fife, who finishes them and butchers them for venison, while surplus hind calves are sold for breeding. The scene today is a long way from when Alan and Tilly started, but the reindeer themselves have been on the Cairngorm mountains since 1952. They were introduced by Swedish couple, Mikel Utsi and his wife, Dr Ethel John Lindgren. Mikel was a Sami, who lived within the reindeer herding area in the north of Sweden, when he and Ethel came to the Scottish Highlands in 1947. “He was surprised there were no reindeer living here and set the wheels in motion to reintroduce the species to Scotland,” explains Tilly. The first Swedish reindeer arrived in the Cairngorms in 1952 and were allowed to graze on land leased from the Forestry Commission, where they remain. Alan came to work as assistant herder as an 18-year-old in 1978 and when Mikel died the following June, he was left to look after the reindeer himself. Elizabeth, or Tilly as she prefers to be called, arrived as a student in 1981 having completed a degree in zoology at Bristol University. She quickly fell in love with the reindeer, the mountains and the keeper and they married in 1983 and given the opportunity to buy the herd after Ethel died in 1988. Alan and Tilly set about extending the herd to its present 150 and developing a visitor centre and shop. They also began to train all the calves to the halter and as adults, the males to pull a light sleigh, which became a popular attraction in the nearby tourist town of Aviemore. "Reindeer are very docile and lend themselves to being trained and handled,” she says. “They have laid back characters and cope well with being removed from their hill environment to busy city centres as long as they are properly handled and cared for. It has also created a use for the castrated males." There are now five main teams of ‘exhibition’ reindeer typically consisting of four adults and two calves and Fiona deals with the logistics of their Christmas tours, which can see them away for a few days at a time. At the time of visiting in the second week of November, Fiona had a team which was at a shopping centre in Edinburgh one day, Glasgow the following day and then, a few days later, a garden centre in Huddersfield before coming home. Meanwhile, other teams travel as far south as Truro in Cornwall, visiting venues on the way south and north on route. "The logistics are tricky and I really appreciate Fiona taking this on. We have a number of country bed and breakfasts we use all over Great Britain which welcome two people and six reindeer for the night." One of their more interesting venues is Northern Ireland, where Tilly and Fiona have to apply for four import and export licences to get them in and out the country. "We are busy from the beginning of November right up until Christmas day when we take them to four local events in Aviemore, then that’s it, they get turned back out on the hill to enjoy the rest of the winter in their natural habitat and we can enjoy Christmas dinner." Tilly admits they get the odd bit of criticism from people who do not believe animals should be used in this way, but says the positives far outweigh anything else. "The negative comments are vastly outweighed by the joy they give to people, especially children, on a visit." The centre also gets a huge amount of support from the adoption scheme, introduced in 1990 which has been very successful. The Smiths try to keep it personal, with all the reindeer having names and adopters receiving a certificate, twice-yearly newsletter and a free pass to the centre to see their reindeer for a fee of £37 per year. 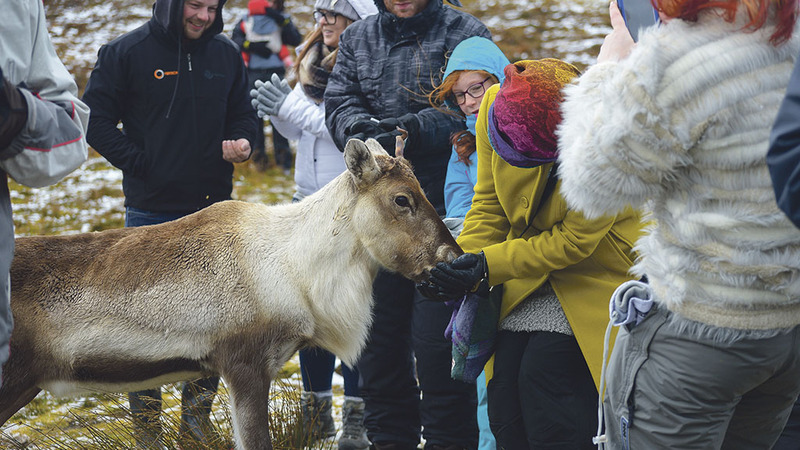 The reindeer on the hill are a huge attraction for visitors to Aviemore, which is a popular year-round tourist destination and the couple have never had to advertise or promote the centre outside of the town. Guides David McKinney and Olly Wilson take visitors on a 20-minute walk from the car park to the hill, carrying winter food on their backs and explaining about the surroundings and the reindeer as they go. David hails originally from Wellington, New Zealand, and has been at the Centre for about six months, while Olly, a countryside management student from Salisbury, came last year for work experience and loved it so much he returned for a couple of months this winter. The maximum number of people for the tour is about 50, dictated by the number of cars which can squeeze into the parking spaces at the centre. Despite it being bitterly cold, with early season snow crunching under foot, it is a hugely enjoyable experience, especially when given handfuls of feed, which the reindeer gently eat from hands. Balmoral the bull and his cows and calves are totally unfazed by the presence of humans on their remote hill, while David and Olly answer the many questions from visitors who hail from as far afield at North Carolina and Lithuania. While the herd is totally free-ranging, it is managed to a certain extent by the Smiths. All calves are tagged to identify which families they belong to and not all the cows are bred every year in order to keep the herd to 150. Some of the male reindeer are castrated and they have a useful life within the travelling teams; castration also means they keep their antlers until Christmas which is a bonus for the general public, who expect to see reindeer with antlers; normally the bulls shed them in December. They are dosed for worms and vaccinated against tick-born diseases to keep them healthy and breeding bulls are occasionally imported from Sweden to introduce fresh bloodlines. Unlike some of the controversial re-introduced species in Scotland, reindeer have settled back into the Highlands with no fuss or recriminations, and are providing many people with an income and a job and many more with joy. In fact, the Cairngorm reindeers are very much proof they don’t just appear at Christmas.